One of the big problem with these filters is that when you attempt to focus them the filter goes through the point of focus before the point of focus is reached in the eyepiece. When this happens, the focused heat of the sun is on the filter and the intense heat can make them crack or even burst. One of the reasons why these filter crack from the heat is that they are usually held too tight in the cell so the difference in the expansion of the glass vs the metal that is causing the failure. The usual mode of failure is that you have been observing the Sun for a number of minutes or longer and that is when they crack. Having a solar filter mounted in a black cell is also not the greatest piece of optical engineering. If you run the experiments be sure to run one were the filter is mounted on the end of the diagonal. Also measure were the focal plane is in relationship to the end of the eyepiece you use. With many of the simple eyepiece designs that came with vintage 60mm refractors, the longer the focal length of the eyepiece, the far the focal plane of the scope was from the end of the eyepiece when it is in focus. That put the filter in position in the optical path were the energy was spread out. The shorter focal length eyepiece come to focus were the focal plane of the scope is very close to the end of the eyepiece, putting the focused image of the Sun on the filter. I'm wondering if the cause of failure of these filters is that one first was observing the Sun with low powered eyepiece and then wanted to take a closer look at a Sunspot and switch to higher magnification and that put the filter in position were the Sun was focused on the filter. Not 2/3 more, but nearly three times as much, because heat is proportional to the area of the objective. I used one of my vintage sun filters this past evening close to sunset with a 20mm Huygens eye piece in my 60mm Celestron/Vixen Cometron 910mm focal length. Nice view, green, did not view for long. Wish I could find a Swift or Tasco Herschel wedge but they are not easy to find. I used one of my vintage sun filters this past evening close to sunset with a 20mm Huygens eye piece in my 60mm Celestron/Vixen Cometron 910mm focal length. Nice view, green, did not view for long. Seems a shame to risk blindness when safe solar filters covering the entire objective are readily available, but none of us can tell others what to do. I am sure we are all glad that you enjoyed a fine view and came to no harm. Still, such good fortune does not change the thrust of this thread, nor our responsibility to educate the pubic on the safe use of classic telescopes. Many people used this type of solar filter back in the day. Had it been 100% dangerous 100% of the time, no one would have used it. The problem is analogous to wearing seat belts. People will say, "No need; I'm not going far." Looking simply at the facts, the equations of kinetic energy have no factor representing the total time or total distance traveled prior to the crash. Only the velocity at impact matters, with consequences that may be severe. In the case of this old style of solar filter, blind is blind, regardless of how many successful viewings one has had in the past, or how fine or long the view immediately prior. I hope the filters you are testing are NOT the old fashion dark filters. You were lucky the first time, you may not be so lucky the next time. If Jon tests his remaining solar filters without looking through them, he may gather interesting historical data, or even open a niche field of solar photography through sacrificial cameras. I support his experiment, with the caveat that we would be responsible to convey that no readers should misinterpret the result. Suppose he showed that, over so many hours, these filters placed at the diagonal of a 60mm scope did not break, whereas one already broke promptly when screwed to the eyepiece of a 100mm scope. Given the stakes of instant blindness, the inherently flawed engineering of placing the filter after the objective, and the uncertain quality of all such antique filters of this type, it would still be unsafe to use them, and irresponsible for this forum to condone their use with live human eyes. Yes they are the old fashioned ones. But I won't be looking through them. This will just be a test to see how long they will go before breaking. I won't look through them. DAVIDG made a very good point (as always) that the sun filters did not have thermal expansion capabilites. A Ramsden eyepiece had an old solar filter mounted between the two elements of the eyepiece? And mounted in a manner to allow for some thermal expansion? And only used on a 60mm scope? The filter would not be near the focal point. Do any of you have reports of the lenses in your old eyepieces cracking from solar observing? I know that more complex eyepiece can be damaged but I have never heard of the two lens eyepieces (Ramsdens, Huygens) being damaged. Eye damage is serious stuff. I've been an amateur astronomer for over 30 years and have been observing the Sun all that time. I have had a filter crack on me while I was observing the Sun and looking into the eyepiece when was I kid. Since then I have had my eye examined many times and told the Doctors what had happened and they could find nothing wrong with my eye. I did not have any lose of vision or any problem after the filter cracked. I'm still lucky to have 20/20 vision in both eyes, today. Maybe I got real lucky but over years I have read that when these filters crack one is going to suffer instant blindness. While this is very serious, I would like to know if anyone has FIRST hand knowledge of eye damage caused by one of these filters cracking. I know that people have suffered eye damage from looking at eclipses but that is different. I do scientific research for a living and I like to see the data and seperate the facts from the fiction. On a side note I have seen full aperture solar filter fall off telescopes and have seen the wind blow them loose so one needs to be sure that they are mounted very well. I have witness first hand when a full aperture filter came loose and it wasn't more then 3 seconds later, smoke was coming out of the telescope and a few months ago there was a newspaper article I read were a telescope was left unattended during the day and caused a deck to catch fire. While I am not defending the use of these screw on type filters, if they crack, your letting light in thru the crack vs if you loose a full aperture filter you have much more energy at the eyepiece. This is why I built a telescope designed for white-light solar obsevering, with many built in safety features. If any part fails, it fails safe and no image can be formed at the eyepiece. I would like to hear more about the design of the telescope you built for white-light solar obsevering, with all the built-in safety features. Can you show us pictures with lots of close ups of the features along with a detailed description? I might want to build one. Perhaps this is already documented and in that case can you just point us to that? I would like to hear more about the design of the telescope you built for white-light solar obsevring, with all the built-in safety features. Can you show us pictures with lots of close ups of the features along with a detailed description? I might want to build one. Perhaps this is already documented and in that case can you just point us to that? There is a decent tutorial on how to design a dedicated solar scope on pages 43 and 44 of Sam Brown's 'All About Telescopes'. It isn't a step by step tutorial, as you will need to use the various tables to calculate the strength of the image based on the type of telescope you are designing, and then the appropriate filtration or attenuation to knock the image down to safe levels. I have yet to run across another book anywhere that discusses the construction of a dedicated white light reflector. Mine is a 4.25" f13. It's a 4.25" f/10 newtonian with the primary and secondary that are uncoated. Only 5% of the light is reflected off of the primary and then 5% of that off the secondary. The light then goes to a Herschel wedge that can be rotated. So none of the surfaces ever seen concentrated solar energy. Heating and distortion of any of the optical surfaces does not occur. Since the light coming off the secondary is polarized, by rotating the Herschel wedge I can cross polarize the light and tune the brightness of the image to fit the sky conditions and magnification used. The Herschel wedge is held in place by a screw so it's not easily removed. If anything of the optical parts should fall out or some how fail no light can reach the eyepiece. If some how some one would remove the Herschel wedge and look into the 'scope they would see light that was reduced in intensity by 0.0025. The reflection off of glass or water is brighter. The optics are held in an oversized cardboard tube and the mirror cell has a fan on the back. It allows air flow but no light from the outside to get in. The result is a very high contrast image. When the sky is clear, the area around the Sun is ink black. The grandulation on the surface of the Sun are almost always visible and Sun spots show amazing detail. I designed this 'scope to be used at public outreach events since I know it's safe. One would have to work very hard to hurt themselves observing with it. I don't have to worry about a filter failing, a coated developing pin holes or having a kid pull a full aperture filter off the 'scope or the cap off a finderscope and looking in when I turn my back for a second. Here is a picture of my homemade Herschel wedge. The wedge itself was sold by Edmund. This one was chipped along the edges and ground it into an ellipse. It's mounted in a PVC pipe Tee. The assembly rotates and in the picture the eyepiece is at 90 degree to the tube and in that position the images is it's dimmest because of cross polarization. When the eyepiece is parallel to the tube the image is at it's brightest. That is really neat.So there is a good and proper use for uncoated mirrors. One little note about safety: although the reflectivity of 1/4 of 1% sounds very safe,everyone should remember the scope is gathering considerably more light than the naked eye.So if the scope gathers 400 times as much as the naked eye ,then looking into the scope without the Herschel wedge would be like staring directly at the unmagnified sun.Bigger aperature scopes could be dangerous. Wonder if one of the common cheap 76 Newts could have its mirrors stripped of coating and then be safe for solar viewing? Eye damage is serious stuff... I have had a filter crack on me while I was observing the Sun and looking into the eyepiece when was I kid. Since then I have had my eye examined many times and told the Doctors what had happened and they could find nothing wrong with my eye. (W)hy I built a telescope designed for white-light solar obsevering, with many built in safety features. If any part fails, it fails safe and no image can be formed at the eyepiece. Glad to hear you are okay after the filter cracked. Perhaps the outcome would have been less fortunate had it shattered? I have to agree, I have no first-hand knowledge of instant blindness occurring. 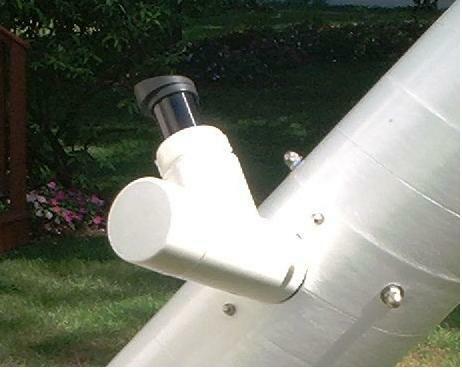 It may be an urban myth, yet seems like a realistic possibility, one easily prevented by carefully securing an aperture filter in place; or, better yet, by building or buying a dedicated, fail-safe solar telescope. I vote that we continue to teach not to use these filters. If an errant telescope can burn a deck, there is no reason to risk damaging anyone's eyes. Well...... I have a cheap .965 EP drifting around here somewhere that has a plastic field stop with an arc-shaped hole melted out of it........ no news of the former owner's eyeball, but glad it wasn't me! I don't have a digital thermometer. 102mm - The results from this test are already known. Let me start with these tests and we can add others after we have the results. I may not have enough filters to do all the tests. If anyone has any spares they can send me that would be appreciated. So I'm blocked at the moment. Clouds just rolled in too! It would not surprise me if you had a steady supply of these filters, that if you averaged the "accumulated exposure time" at prime focus to the sun ... they would all break around the same time (plus or minus a small scatter). You'd end up with a Gaussian distribution, and this would prove that the issue is accumulated thermal stress/strain leading to a fracture along a weakest member. Thus all these things ever were ... a limited lifetime component with a terrible failure mode. What's even worse was that the cost trade-off of a small piece of welders glass verses a few square inches of aluminized mylar is tiny. Probably just happened because of the cost of the vacuum equipment for doing the coatings. This is probably a silly question but will the SUN filter let enough light through to project an image on the solar projection screen? I'm only testing for the filter cracking nothing more. I won't look through it or use a camera. It might be possible to unscrew the barrel on the star diagonal and replace it with one from an eyepiece, that is thread for filters. Also please make a note of how tight the filter is in the cell. It should rattle slightly when you shake it. If not I would loosen it, then run your tests and then repeat the tests with the filter tight in the cell. It's been stated that these filters might shatter. Does anyone have first hand knowledge that a filter shattered ? I have seen them crack but not shatter. It's important to seperate the facts from the fiction and understand under what conditions these filters fail and how they fail. It has been posted that these filters fail when used with telescopes that have apertures larger then 60mm. If the filter was designed for use on a 60mm telescope and failed when used with one larger, is that the fault of the filter or the user of the telescope ? If the filter was designed for use on a 60mm telescope and failed when used with one larger, is that the fault of the filter or the user of the telescope ? Strictly, exposure time per unit area of objective (assuming consistent, bright sunlight). The point is the same. One filter is likely as robust (or imperfect) as the next. Whether or not blindness is a realistic risk, pain surely is, and one never knows when a particular filter will fail. It may sound morbid, but the army has data on how quickly a given intensity of light will blind an enemy hit with a laser weapon. A scope isn't a laser, but it intensifies light. Anyone know the facts, or care to research them? In my 1962 Tasco catalog, in addition to several 60mm refractors, the SUN filters also came with the Tasco 10TE Solarama 600 refractor which has a 76.2mm objective lens, and the 11TEA Lunagrosso which is a 4½” Newtonian.